I love sweet potatoes. They taste like dessert to me. 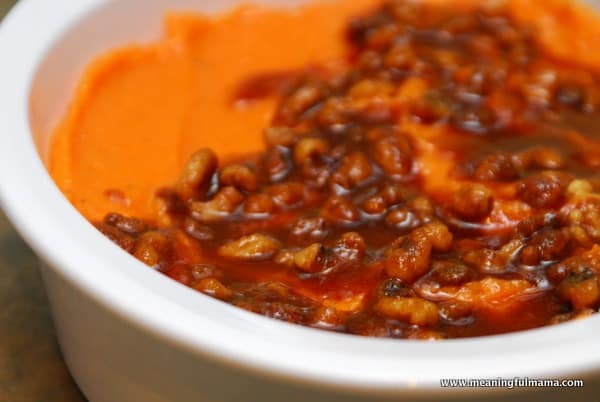 This Orange Praline Sweet Potato recipe is, especially, delicious. This is another recipe that comes from my mom’s collection. I asked her where she originally got the recipe, and she went back to try and figure it out but was not sure. I can tell you that the crunchy and sweet praline top is like candy. I did leave a little section of it off because I knew my kids might not even try it seeing it had that top. I was right, but man they were missing out. Oh well! More for me. What about you? 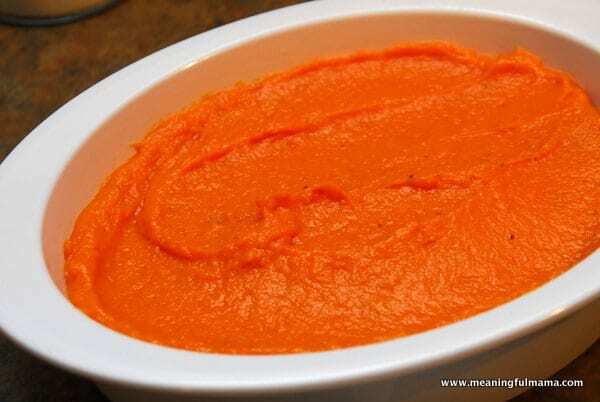 Are sweet potatoes a Thanksgiving tradition for you? Do you just stick with the traditional mashed potatoes? 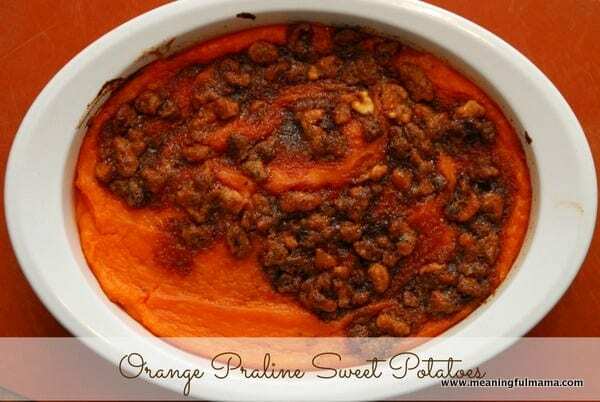 These orange praline sweet potatoes aren’t necessarily a traditional recipe, but they do have a similar flavor profile. To me, it is a step up from your grandma’s traditional recipe. No offense to your grandma. Like my mashed potato recipe, this is a dish you can make the day before, which makes preparation on the day of any event much easier. Boil a pot of water. Add potatoes and cook until tender, 20-3o minutes. You should be able to pierce it with a fork. In a mixer or with a hand mixer, beat potatoes until smooth. Add orange juice, grated orange zest, Brandy, salt, pepper, 1/4 cup melted butter, 1/3 cup brown sugar and egg yolks. Beat until fluffy. Pour into a 12″ porcelain quiche dish or shallow pan. Combine remaining ingredients (1/4 cup melted butter, 2/3 cup brown sugar, pecans and cinnamon). Spread over the potatoes. Cover and refrigerate overnight. 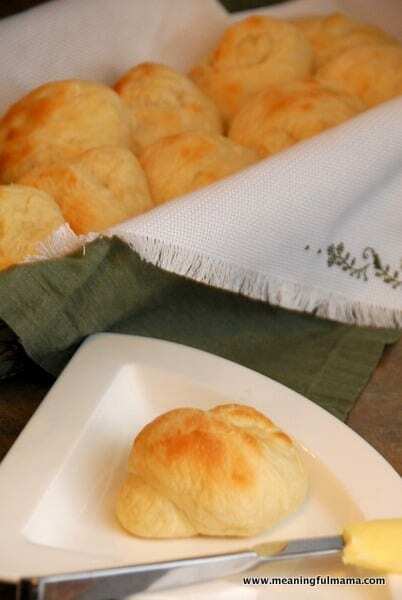 Bake on 350 for 45-50 minutes until brown and bubbly. Let stand for 10-12 minutes. Here’s the sweet potatoes before adding the praline topping. Here is the dish before entering the oven. 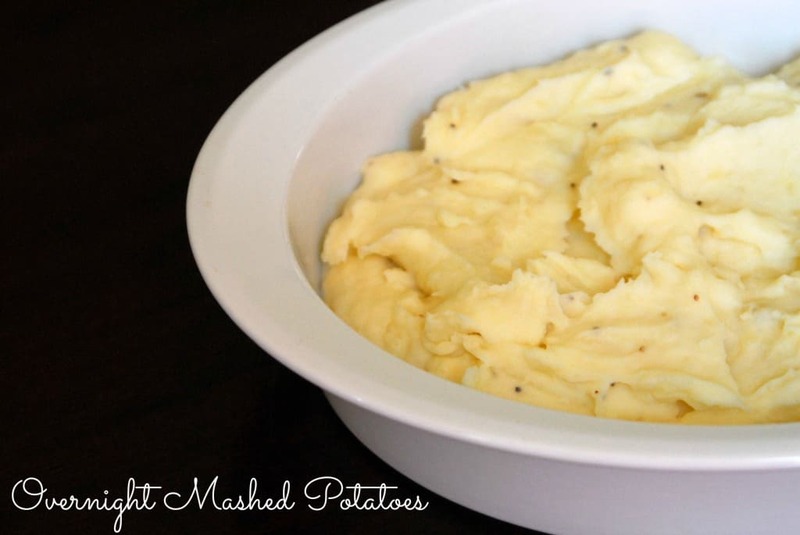 If you are looking for a great mashed potato recipe, you should really try my overnight mashed potatoes. Make it the day before!